Not too hard in this canyon, which, though somewhat pretty, is not too terribly exciting. Just when it starts to get going, the technical part ends. "Not much meat on this bone," was the consensus of our party. Still, it offers easy access to the top of the North Fork of Robbers Roost Canyon, and this write-up includes "The Crack" exit back up to the civilized world. 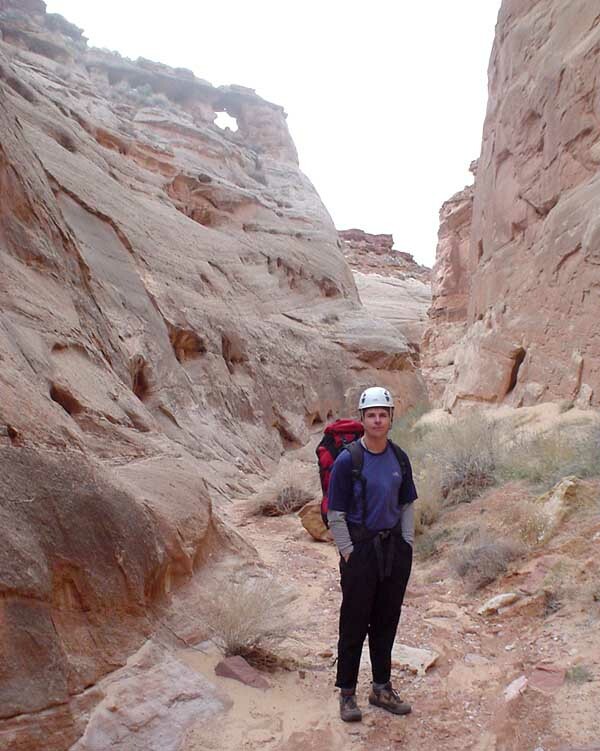 It makes for a fine day visiting some remote and seldom-visited deep canyons, while not taxing your technical skills. On the other hand, another party found deep, muddy potholes that required swimming and cleverness to exit. The canyons are constantly changing - be aware, have fun, but be safe. Natural anchor skills required. Some parties have reported difficult pothole exits in certain conditions. A long day in a remote location. 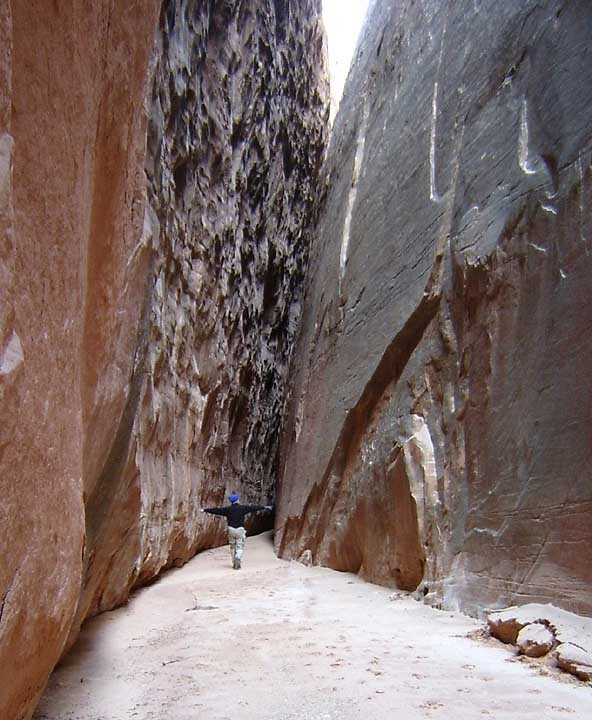 Narrow spots would make taking big packs through here difficult. This adventure accesses the North Fork from the west, from the Texas Hill road. From Highway 24 near the Temple Mountain Road, take the road into the Roost 15.7 miles to the top of Texas Hill. Turn right on a side road (the Texas Hill Road) that leads past a small ranch, and drive 5.6 miles to a small road on the left, through a cattle gate. This is the North Fork 4wd road that leads to the start of this adventure. If you have a second car, continue on the Texas Hill Road 1.3 miles to another small road on the left. Drive this road a quarter mile or as far as clearance allows, and park. After closing the cattle gate behind you, drive down the 4WD road through some soft sand about 2.2 miles to a parking spot before a drop into a wash.Those with full vehicle capability may be able to follow the jeep trail past this spot. From the parking spot, drop into the wash and pick up the jeep road on the other side. 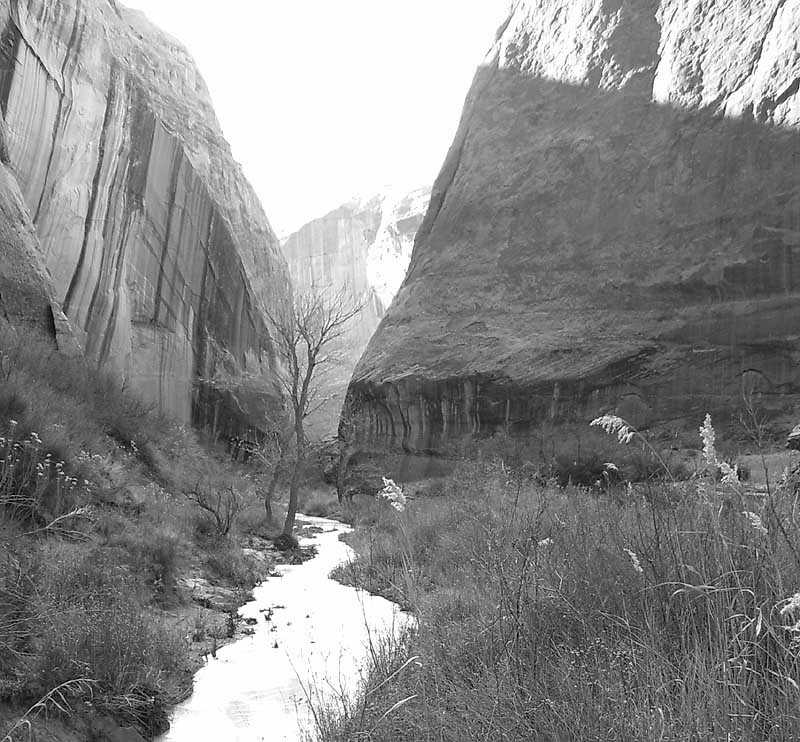 This wash is what Mr. Kelsey calls the Main Fork of the North Fork, Robbers Roost Canyon. Follow the road up a hill and down into the next wash, in about 0.9 miles. Continue on the road up the next hill to an overlook of the next major wash (another 0.5 miles) and find a way down into it. 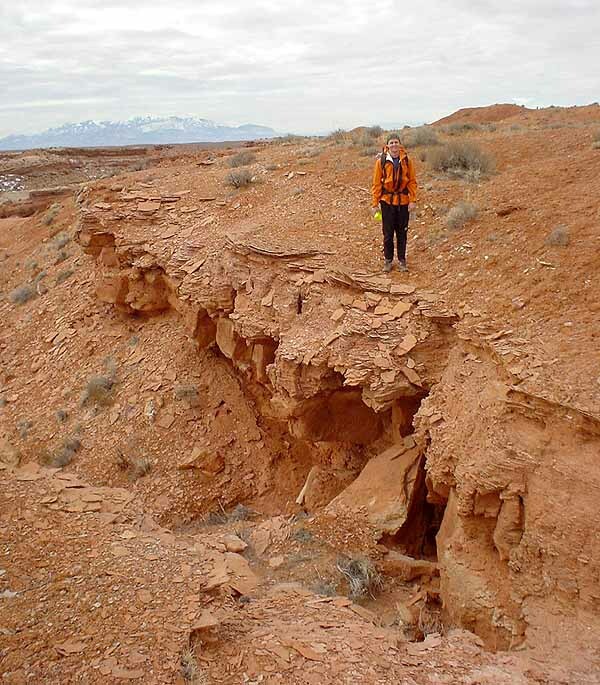 The easiest way might be to continue on the road to the northeast to where it crosses the wash. We cut onto the difficult terrain on the front of the hill and worked our way down in. 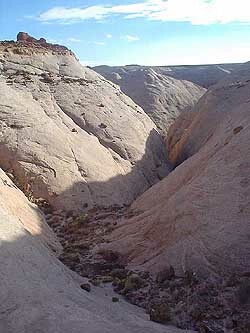 Follow the wash southwest through the Carmel formation. Keep your eyes peeled for an arch up and left. 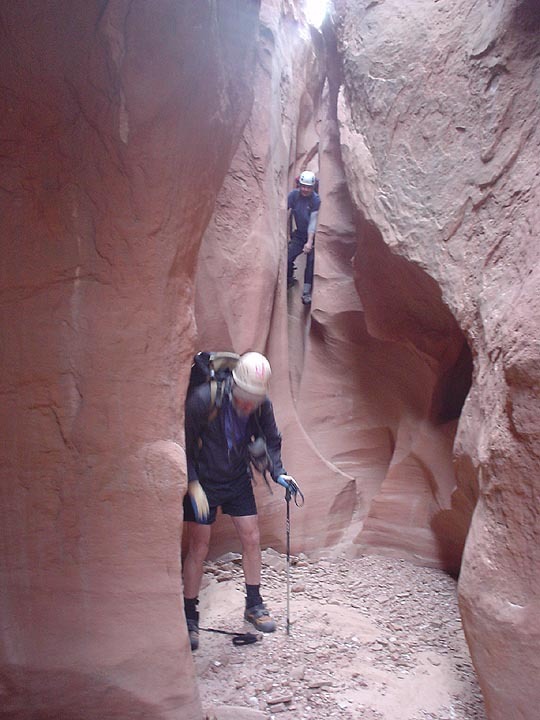 The canyon eventually reaches the Navajo sandstone and starts to slot up, then drops into a nice slot with a bit of downclimbing and controlled sliding. A round pothole pool can be avoided with a quick step to the right. 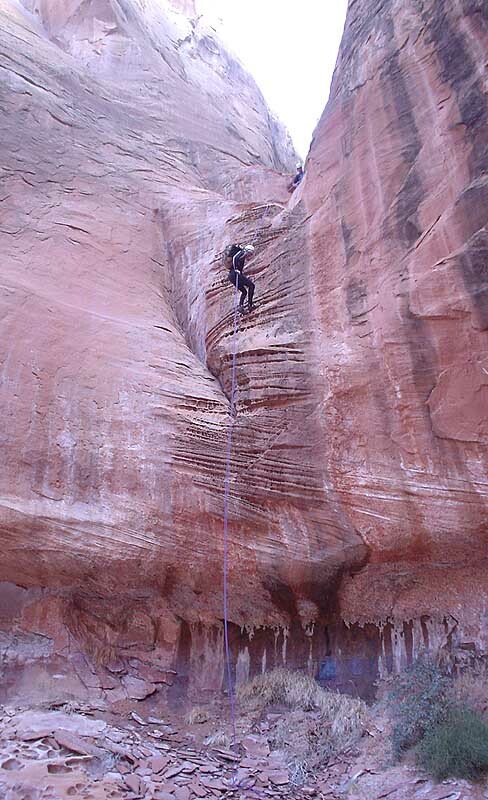 A short rappel off a chockstone soon leads to a longer rappel of chockstone. Both of these might require careful rigging and quite a length of webbing - be sure to have about 40 feet of webbing available. 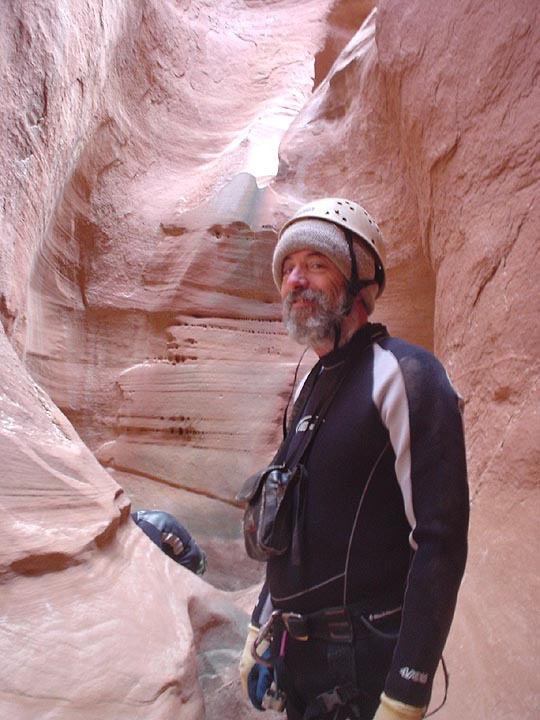 The final 60-foot rappel is down a sculptured wall, and takes one to "the land of the living". Pack up the harnesses and rope. The North Fork of RR is a magical place. At some times of the year, there will be a bit of water flowing - at other times not. Big huge walls soar above the flat, sandy bottom. Canyons shoot off to each side. Track your location on the map so you will find the exit canyon. 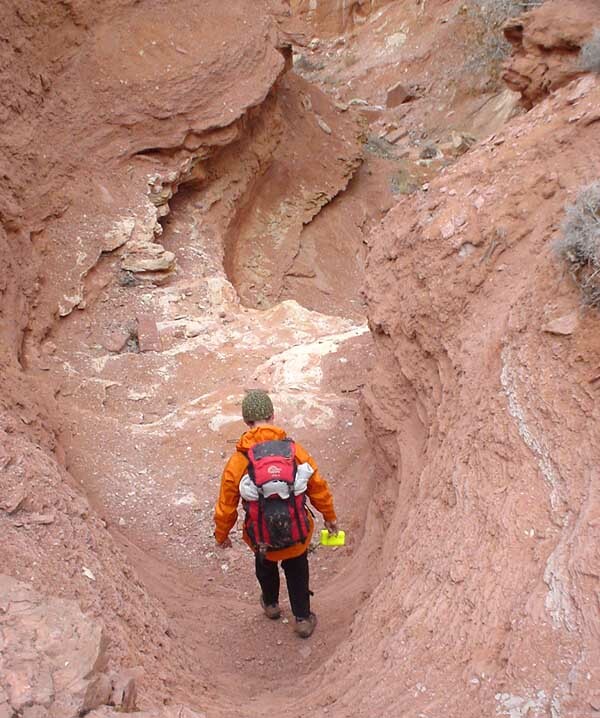 About half a mile downcanyon, a large canyon comes in on the right. Hike up this a quarter mile to a neat black slot, and shortly, a dry fall. (This is Mr. Kelsey's Main North Fork). Just downcanyon on the right is the first of two possible exits - the Partner Climbing Exit. 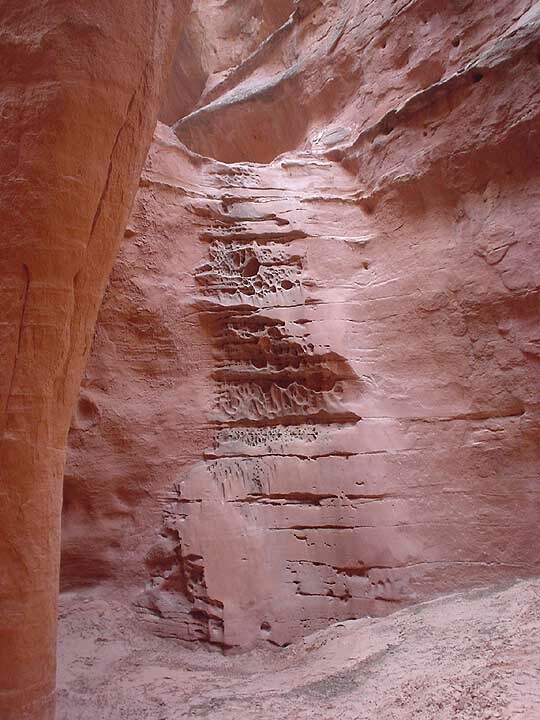 This canyon enters the main canyon as a slot at ground level. Continue downcanyon another 1000 feet, and another canyon comes in on the right, about 10 feet above ground level. This is the Crack Exit. ...at the Crack Exit Canyon. The Partner Climb Exit requires at least 3 people, and a rope is useful for getting the second and third persons up. 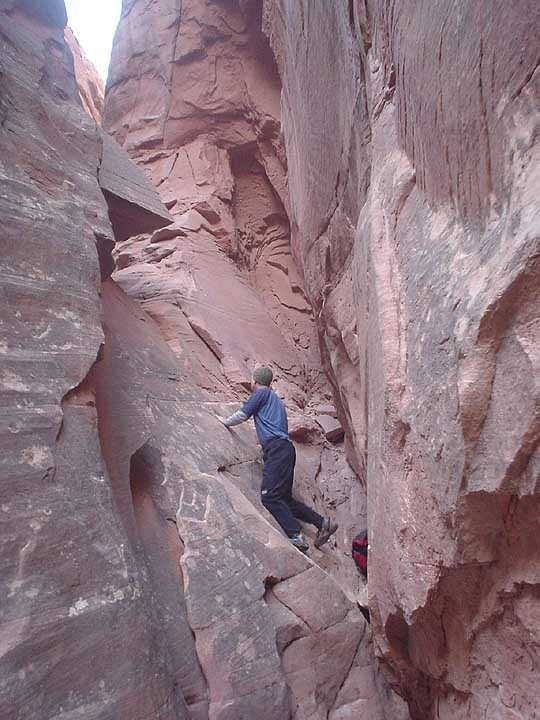 Climb up the crack - a little bit of offwidth action just off the main canyon. 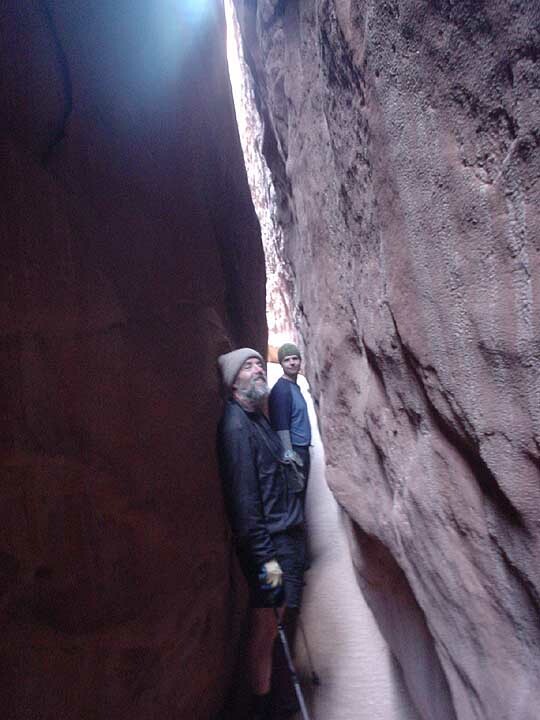 After a couple hundred feet, the canyon bottom flattens out but the canyon is still quite narrow. Follow this back a ways to a cul-de-sac. Chimney up the watercourse 12 feet to a small pothole ledge. A partner assist may be required here. An easy but exposed move leads up to another series of ledges. From the highest ledge, assist the smallest person up the blank slab as high as possible. 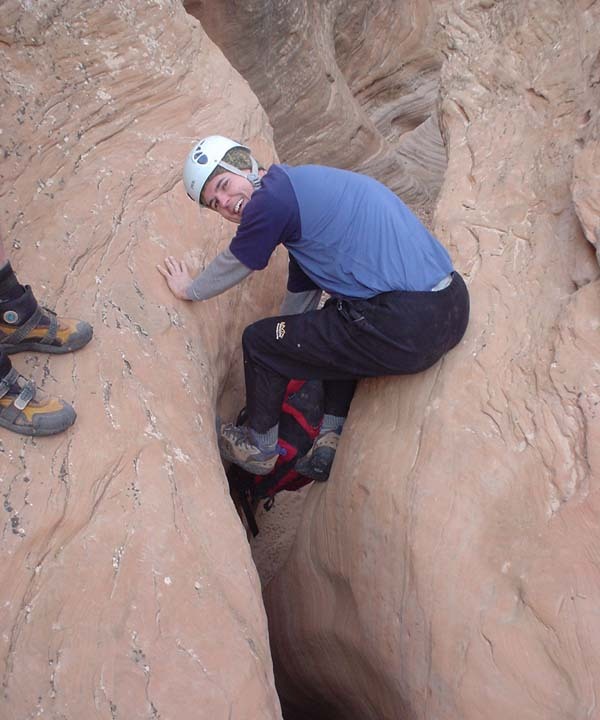 A belay can be set behind a chockstone for an anchor. Follow the canyon back to the final headwall. A ledge is followed up and right (5.4?) to easier ground. From here, a large ramp leads up and left to the upperlands. Look for a fence on the hill to the northwest, and beeline for that. Follow the fence to the crest of the hill, then to a gate. Cross to the left side of the fence. The vehicle parked at the North Fork Exit Turn should be in sight, about 20 degrees left of the fence line. Walk the dunes across the upper, flat drainage of White Roost and toward some small, red slickrock domes, and the spur road. The Crack Exit is probably easier and faster. Enter the slot and climb upward. After a short bit of easy climbing, a short wall is encountered. Climb the wall on roundish holds (5.6?, 12 feet), then assist your partners up. Continue up the slot and, with many brief, fun, strenuous-but-not-exposed chimney moves surmount difficulties. Strenuous sections alternate with easy walking. Work your way to the top. 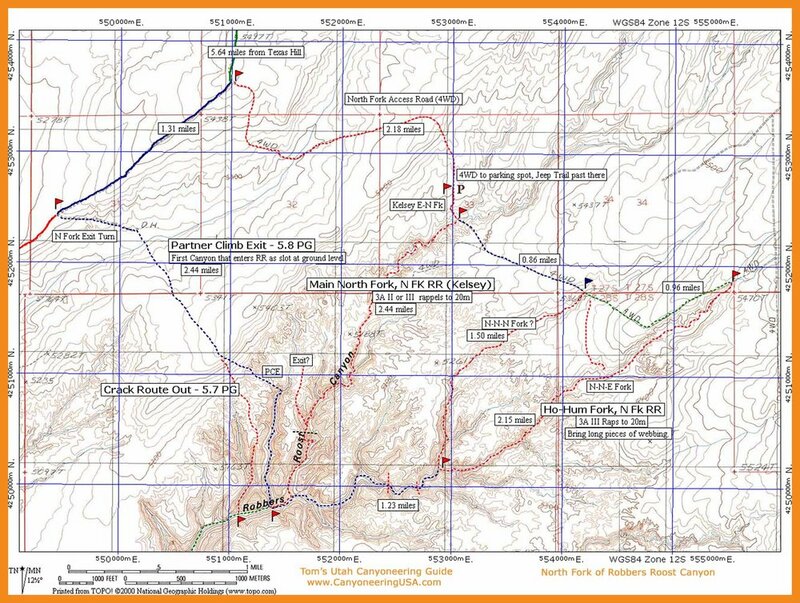 Ram and I did the Ho-Hum Fork of RR on December 28, 2004, and found it... unexciting. Subsequent parties have found pools and one nasty pothole escape. 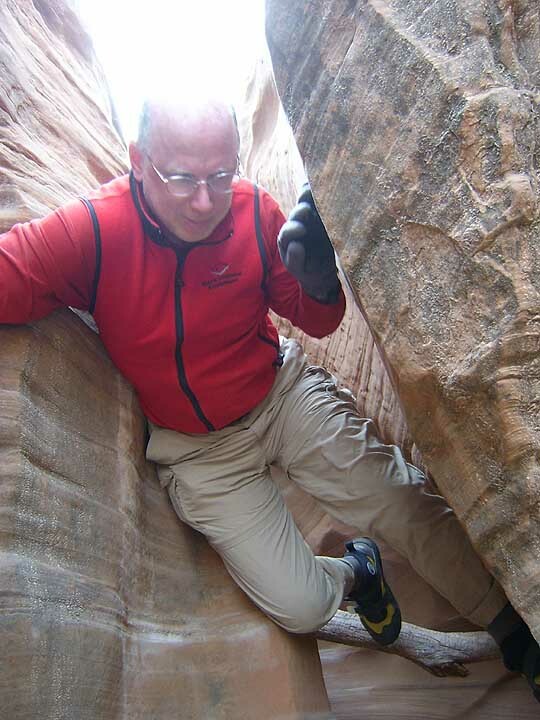 Always be cognizant of the ever-changing nature of the canyons!